Korean developer GamePrix has announced Kinect support for its upcoming game Divine Souls. It seems that even Xbox's peripherals aren't exclusives any more. Gameprix, a relatively new Korean game developer, has announced that its action MMO Divine Souls will boast the ability to utilize the Kinect. The game, which is currently in beta and will be released free to play, focuses on bringing the mechanics and flash of console fighting games such as Tekken to the XP and loot-laden world of MMOs. 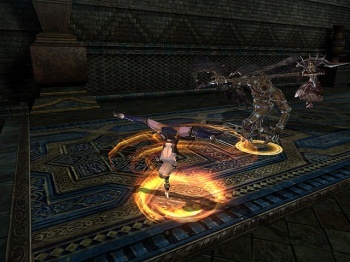 The game draws heavily on the style of console action games and fighters (the tagline is "Your Console Will Be Jealous"), up to and including the control scheme. "The game's support of gaming pads make it resemble console games even more, and is scheduled to support Kinect, a new control system of Xbox 360," says the company. The company also stated that there were several companies currently approaching Microsoft trying to use the device, so while Divine Souls is the first PC game to use Kinect, it will not be the only one for long. I wonder though, does the Kinect really belong on the PC? This is a device that requires you to stand six feet away from it, and is prone to bouts of inaccuracy. PC gamers mock console controllers over how imprecise they are compared to a mouse, and you expect them to embrace motion control? Ignoring the fact that you are asking PC gamers to stand and jiggle to play a game, you're asking them to sacrifice precision and speed for the privilege.